Lead vocalist and main songwriter Trent Wagler, who also plays guitars and banjo, is the mainstay and leader of this tremendous band that has quite a complicated recording history. Multi instrumentalist Jay Lapp has been with him on most of that journey that has eventually culminated in yet another excellent and diverse album. 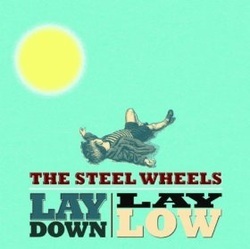 Basically, the first album was just credited to Wagler although Lapp worked on it with him, the next was by Trent Wagler & the Steel Wheels, followed by two credited to both Wagler and Lapp and finally three albums, including this one, by The Steel Wheels, all of them being highly recommended. The lineup of this quite original four piece band is completed by the also excellent Brian Dickel on upright bass and Eric Brubaker on fiddle. Probably the biggest difference between this band and the other young bands that play within or just outside of the bluegrass genre is that this band seems to include a British Isles or Celtic feel that blends with the music of the Appalachians. They even include some strong gospel influences that evoke music from a much earlier time than bluegrass, but all updated for the 21st century! Fairly obviously Wagler is the focal point of the band with his keening, almost strained, but tunefully powerful lead vocals giving the band its signature sound, with the addition, where necessary, of some absolutely tremendous harmonies from the rest of the lineup. The playing is always of the highest quality with all four members contributing greatly to the variety of sounds that just about cover the history of the Appalachians from music that would have been recognizable by 19th century immigrants as well as modern day roots music fans. The first four songs exhibit the versatility of this tremendously talented band, with the first Breaking Like the Sea being an excellent example of how the best bluegrass has an edginess to it, consisting of some expert fiddle playing and the ringing mandolin added to some quite brilliant harmonies . The second, which is also the albums title track, Lay Down, Lay Down, has a folksy feel, thanks in the main to the fiddle that just as easily evokes the Scottish highlands as those of the Appalachians, not only in style but also lyrically, being an incredibly sad tale of loss. This is followed by a powerful accapela gospel song Rain in the Valley with this in turn being followed by a terrifc mandolin and fiddle driven Jay Lapp written instrumental. The first two songs are co-written by Wagler and Lapp, with the third, already mentioned, by Lapp and the fourth by Wagler. There is another excellent ‘hoe down’ instrumental Fridley’s Gap, also written by Lapp and all of remainder of this tremendous album coming from the Wagler pen! Halfway to Heavan is a powerful country love song with atmospheric dobro and mandolin setting the pace, fiddle weaving in and out and Waglers vocals dictating the story with some atmospherically subtle harmonies. Those harmonies are at times reminiscent of tremendous British band Southern Tenant Folk Union, with the also excellent Endure probably being the best example of this comparison. All in all, a tremendous album that keeps slightly to the left of much of the roots music currently on offer and shows the development of an original sound from a group of musicians that were pretty good to begin with!